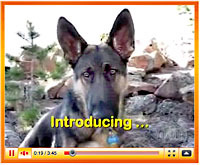 Tripawds Sheriff Coming to Your Town, Let’s Pawty! Tripawds Midwest and East Coast Winter Tour 2012 visits Greyhounds Rock canine cancer conference and three legged dogs around America. Three legged adventure dog travels along the Rio Grande River in Texas. Tripawds three legged spokesdawg Wyatt Ray goes for exploratory surgery at Colorado State University. 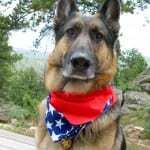 Three legged German Shepherd Wyatt Ray salutes his Tripawdfather Dad.